In to "bear one another’s burdens" the Church has set up a welfare program for its members and also a relief organization that provides humanitarian service. About a mile west of downtown Salt Lake City is 13.5 acres of Church owned land. On this area is a bakery, cannery, dairy plant, thrift store, storehouse, and employment center. This has known as Welfare Square, and is used to provide items and assistance to families in need. The cannery on Welfare Square is only one of 97 Church cannery buildings that can be found in the United States, Canada, and Mexico. 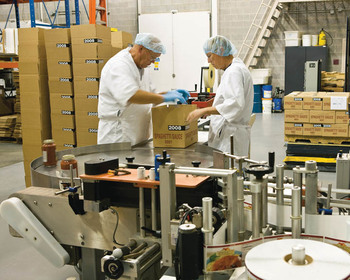 The cannery facilities are designed specifically to bottle products like spaghetti sauce, salsa, applesauce, jams, and other foods that are too acidic to be put in metal cans. The products are then sent to one of over a hundred Bishop's Storehouses all over the world for distribution to families in need. Marion G. Romney, “Work and Welfare: A Historical Perspective,” Ensign, May 1982, 87. The canneries provide much more than just food to be stored in the Bishop’s Storehouses. Facilities can be used by those outside of the Church to provide for different organizations, such as hospitals. Excess food that is provided by Church farms is often canned and donated to food banks. The Church also encourages individuals to use the canneries to begin or add to their own food storage. Church leaders encourage that each family have its own reserve of food in case of personal emergency, such as the loss of a job, or for natural disasters. This page was last edited on 13 February 2012, at 01:59.